The Music Ministry of Peters Creek Evangelical Church is an active, integral part of Church life. Our adult choir is a dedicated group of volunteers who rehearse weekly and sing at least 3 times monthly for the 11 am church service. 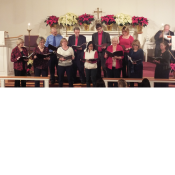 The adult choir meets from 7:00 to 8:00 on Wednesday evenings in the church sanctuary September through May.